This video will cover the XWP series triplex plunger pumps and how to replace the Inlet and discharge valves along with the pistons, seals and guides. Pumps included includes: XWP55.14N, XWP55.14N, XWP50.15N, XWP60.13N, XWP65.12N and XWP70.12N. The inlet and discharge valves may look similar but they are not the same. To access the pistons and their guides start by removing the 8 head bolts with an 8 MM allen socket. Once the manifold is off there will be parts either on the pistons or still in the head of the machine. To remove parts off of the pistons start by using a wrench or your hand to rotate the crankshaft, this will push the parts towards the end of the piston making them easier to twist off. The best way to take the parts out of the head is to use a rear piston guide extractor, which we sell on our website. If the seals can’t be taken out by hand, use a small flathead screwdriver to pry them out without scratching the inside of the pump. To replace the pistons, remove the piston bolt using a 10 mm socket. Torquing in a crisscross manner can help evenly tighten the head onto the pump. 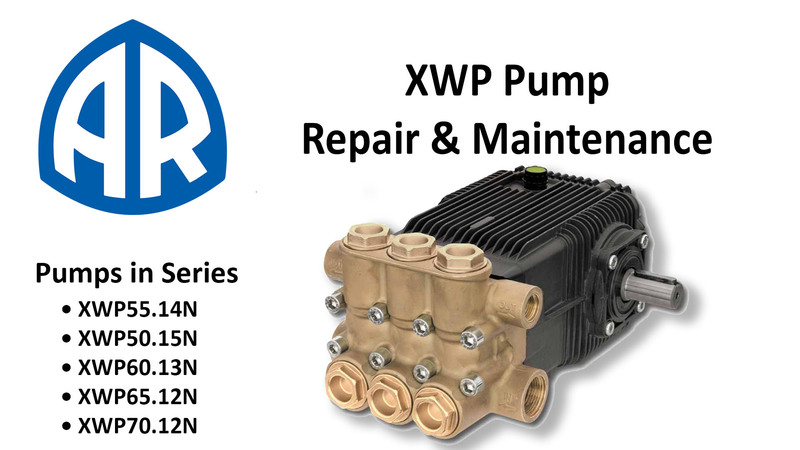 If you have any additional questions about XWP series triplex plunger pumps don’t hesitate to contact us.